A leading real estate developer from Hyderabad, Aparna Constructions & Estates started its operations in 1996. Since then it is known for completing and delivering 36 projects comprising of fully-integrated gated community villas, residential plot projects, premium apartments, commercial projects, spread across 18 million square feet. Aparna Constructions started its new website as the focal point of its renewed digital strategy. 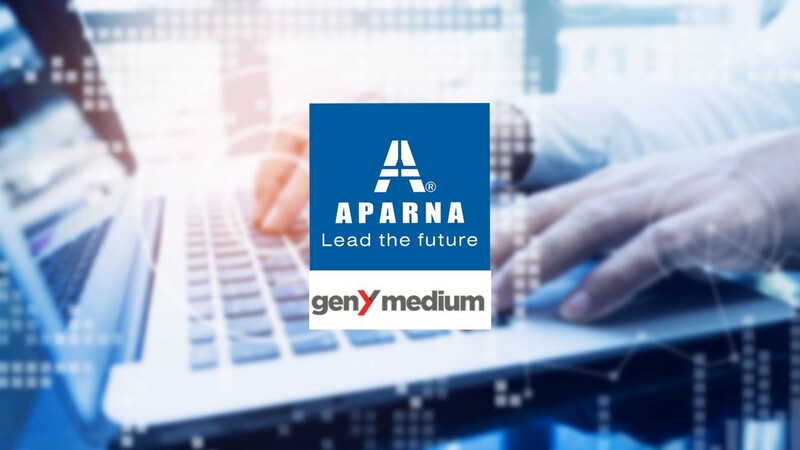 Aparna Constructions has joined hands with Hyderabad’s leading digital marketing firm, GenY Medium. This revamping of brand’s web property has recorded at least twice the amount of organic traffic since then and a steeper spike in the number of digital enquiries. Putting the customers first, has always been the thought and vision of Aparna Constructions, which has been kept well in alignment with this digital initiative. Nowadays, a website has a critical role in establishing the brand’s identity as well as generating leads, and this could be very fruitful in the real estate sector. As the website is a digital interface, which can become an important touch point with the consumers. An efficient use of the website can enable the organic customer acquisition in a way that it becomes a key channel for lead generation, hence GenY Medium’s holistic approach towards digital marketing, cements the core strengths in consumer understanding and technology. Being a technology enabled digital marketing company, GenY Medium operates out of Delhi, Bangalore and Hyderabad. Since its inception in 2012, the company has grown into a 100+ people company and has created proprietary technologies that revolutionize digital marketing. On their collaboration with the GenY Medium, Aparna Constructions elaborates on the need of a digital platform for its multiple projects in different cities and locations. This website provide the users with a wide range of choices, in a mobile friendly way, by providing each user with a personalized web experience. A deep research exercise was conducted by the Aparna Constructions’ business teams and the GenY Medium’s team, to understand the unique consumers’ mind-set and adopting to the most suitable technology. With its ability to personalize content, supplemented with marketing automation tools, the Oracle platform along with its suite of products, turned out to be an optimum choice. Aparna Constructions believes that with this kind of technological interventions, their website has set a high standard in real estate segment. Each user is provided with a customized web experience based on geographical mapping by the implementation of Oracle Maxymizer. The next step in line is the integration of an automation tools like Eloqua, which is perfect for lead nurturing through emails. Eventually resulting into a more immersive, personalized web experience. The effect of this new venture has already started happening as the mobile users are spending more time on the website. Aparna Constructions aims to carry forward the momentum gained from the new website to all other aspects of digital platform, with an aim of reaching the right consumer and communicating in a personalized and engaging manner.